ATIT 2018 (आईसीएफएआई टेक स्कूल प्रवेश परीक्षा): The admission test for ICFAI tech now known as ITSAT (ICFAI Tech School Admission Test) is conducted by ICFAI university for the admissions in various engineering courses. The interested students can apply for the ATIT Application Form 2018 from the 1st week of March. The last date for the submission of the form is 9th April 2018. The students have to appear in the entrance exam to get successful ICFAI Admissions 2018. The exam will be conducted on 28th April for Offline mode and from 23rd to 30th April for Online mode. The students are required to submit the ICFAI Application Form 2018 on the official website. The deadline for the online form is 9th April. We will provide here the direct link for the submission of the ATIT Online Application Form. The students just have to follow some precise procedure for the submission of the form. 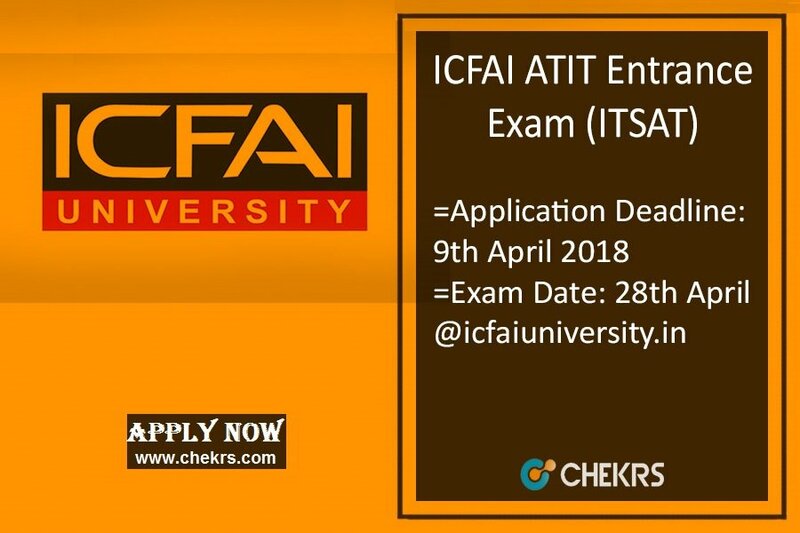 Steps to submit ICFAI ATIT Application Form 2018. The students have to open the official website. Then they have to click on the apply online link present at the end of the homepage. The aspirants have to enter their all valid details in the form like name, qualification etc. Then they have to attach the scanned copy of documents, photograph and signature along with the form. The aspirants must note that the e-mail id they have mentioned is valid. The login id and password will be sent on that id only. Now pay the required application fee via nay of the online modes. Submit the form by clicking on the submit button. The aspirants have to download the application form from the official website. Then fill all your details with a ball or gel pen. The aspirants must note that the details must be correct and valid. After completing the form, attach the photocopy of the documents along with the form. The fees will be paid via demand draft. Send the form to the address mentioned here in the article. The students have to pay Rs.500 for the application form. For Online form, the fees can be paid through any of the online banking modes via secure internet payment gateway. For offline form, the payment of fees will be done through demand draft in favor of “IFHE-Prospectus Fee A/C ITSAT 2018” Payable at Hyderabad. The aspirant must be an Indian Citizen. They must have their domicile certificate. The aspirant must have passed 12tht Class from any recognized board. They must have PCM and English as their compulsory subjects. The student must have scored minimum 50% marks in the qualifying exam. The aspirants who are appearing they can also apply. The aspirants can get admissions in the University via JEE Mains/ or any state level exam but the chances of ATIT Exam qualified students are more. The students who are going to opt ICFAI university Himachal Pradesh, they have no need to appear for the ITSAT Exam. They must have qualified 12tht Class examinations with PCM as compulsory subjects from any recognized University. They must have scored minimum 55% marks in their qualifying exam. Aspirants must have a valid JEE Main 2018 Scorecard. Subjects: Physics, Chemistry, mathematics and English. The students have to study the ITSAT Syllabus 2018 properly. It will help them cover all the topics from which the questions in the exam can be asked. The students will be able to crack the exam if they study all the topics on daily basis with a proper plan.